What a busy year it’s been for me! Six books in a period of 12 months or so. In November of 2017, the book about the Monkees’ music was released (co-written with Mark Arnold). In April of 2018, the second Baker Street Irregulars anthology (co-edited with Jonathan Maberry) was released, along with an audio book version a few months later. In July, the 5th Tales of Fortannis anthology was released. 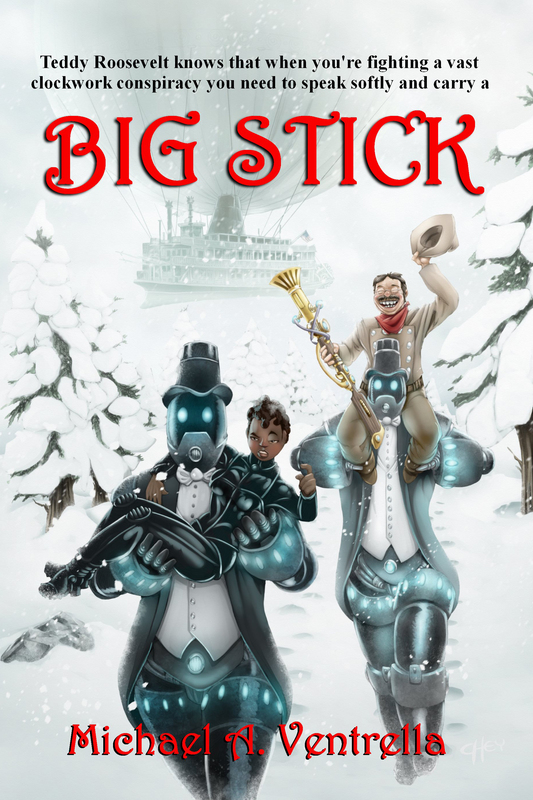 BIG STICK, my 4th novel, a steampunk adventure featuring Teddy Roosevelt and Mark Twain. “One of the best books I’ve read in a long while!” says author Gail Z. Martin. This is being released from Eric Flint’s Ring of Fire Press. RELEASE THE VIRGINS!, an anthology wherein every story has to contain those words. It features David Gerrold, Lawrence Watt-Evans, Jody Lynn Nye, Allen Steele, Steve Miller, Sharon Lee, Keith R.A. DeCandido, Gail Z. Martin and others! This is being released from Fantastic Books. HOW TO ARGUE THE CONSTITUTION WITH A CONSERVATIVE. This is a non-fiction book which a sort of “Constitution for Dummies” because you can’t debate what you don’t know. It’s full of humor and sarcasm and will feature a cover and illustrations from nationally syndicated political cartoonist Darrin Bell (who also does the comic strip “Candorville”). This is being published by Gray Rabbit Publications. And then I have to finish work on the follow-up to the Monkees book, wherein Mark and I discuss their solo careers and the reunions. That will once again be issued from Bear Manor Media. I’m amused at the last book, because I’m currently teaching an adult ed. course on the history of the Constitution. We just spent Wednesday on the judicial branch, including an examination of a Supreme Court opinion (U.S. v. Wong Kim Ark, 1898). My students clearly did not understand how how the Supreme Court worked or how to read a decision, and wanted more information than I could convey in that class.